Coffee; we love it, that much is pretty obvious to regular readers. However, we've always concentrated on gadgets and machines that produce the actual espresso, only giving a cursory nod to latte and cappuccino fans. That all ends today though, as we've been testing THE must-have bit technology for hot milky drink fans. 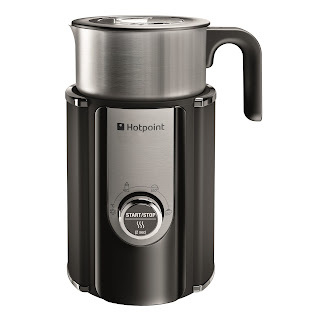 We review the Hotpoint Milk Frother. This compact counter-top gizmo has been designed specifically for heating, foaming, and frothing milk. What you do with the milk after that is up to you, but here in Test Pit Towers we've been adding it to a lot of coffee. This makes it the perfect accessory if you already own an espresso machine and need an additional way to make milk hot, or even if you have one of those pod machines that add “milk” to drinks for you. Trust us, this is miles better. Using induction heating, the Hotpoint Milk Frother features a removable metal jug with a two-part lid (to add more stuff while the machine is actually working), and also a choice of two magnetic frothers. Simply pour in your milk, select either a cold froth (good for milkshakes), 40, 66, or 85 degrees Celsius, then hit start. Even on the highest temperature and with the jug full (making enough milk for roughly two large cappuccinos), the whole process takes only three or four minutes. And the milk is sublime. We're always quite snobbish about coffee, but we take great pleasure in saying this is the best milk preparing machine we've ever reviewed, even more so than the amazingly awesome Lavazza A Modo Mio Fantasia. The finished product, regardless of temperature, is velvety smooth with a think head of foam. Holding back the foam with a spoon when pouring makes for a lovely latte, while letting it all fall into the cup produces a cracking cappuccino. However, should you not be a fan of foam, all you need to do is swap out the magnetic frother. Included also is a smooth ring that, when installed and the machine is activated, won't drag air into the milk, keeping it froth-free. This is a great addition and makes it a superb gadget for those who like their milk good and flat. Since having this we've certainly drank a lot more milk. Buying one of these would mean you could potentially buy a less expensive espresso machine, one without a milk steaming arm built in. And trust us, this is way better than anything like that; we genuinely couldn't live without one now.